This Demonstration illustrates how to calculate the coefficient of performance (COP) of an ideal mechanical refrigeration system using a pressure-enthalpy diagram. 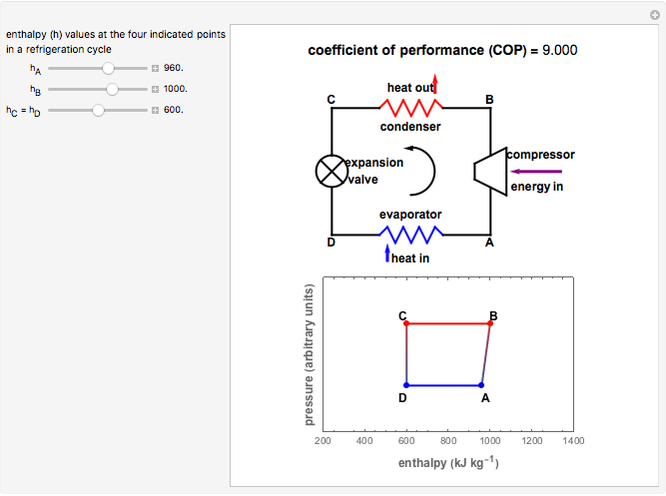 Use the sliders to set the enthalpies of the refrigerant at the four principal points in the cycle. The COP value is displayed above a schematic drawing of the mechanical refrigeration system that shows where energy enters and leaves and the refrigerant's flow direction. A plot of pressure versus enthalpy for the selected cycle is shown below the drawing. 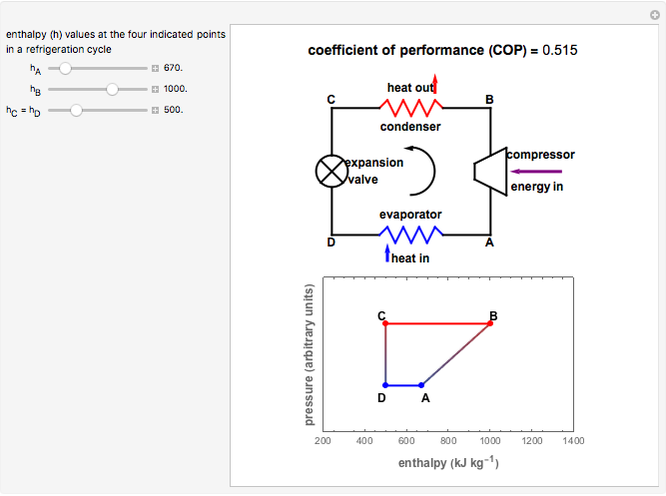 This Demonstration is intended to illustrate the use of the pressure-enthalpy diagram to calculate the energy efficiency of an ideal mechanical refrigeration system in terms of its coefficient of performance (COP). It calculates and displays the COP from the enthalpies at the four principal points in the cycle A, B, C, and D with the formula , where the 's are the enthalpies. A schematic view of the mechanical system is displayed below the calculated COP value. It shows the main components, the refrigerant's flow direction and where energy enters and leaves. The pressure-enthalpy diagram is shown next. The enthalpy values are in while the pressure, which does not enter into the calculation, is presented on an arbitrary scale. The cold side of the cycle is shown in blue and the hot side in red. Note that certain allowable combinations of enthalpy values are not possible in actual refrigeration systems. Mark D. Normand and Micha Peleg "Refrigeration Cycle Coefficient of Performance"